1984-04-09. New. Ships with Tracking Number! INTERNATIONAL WORLDWIDE Shipping available. Buy with confidence, excellent customer service! 1995-09-04. Good. Ships with Tracking Number! INTERNATIONAL WORLDWIDE Shipping available. May not contain Access Codes or Supplements. May be ex-library. Shipping & Handling by region. Buy with confidence, excellent customer service! 1984-04-09. Good. Ships with Tracking Number! INTERNATIONAL WORLDWIDE Shipping available. May not contain Access Codes or Supplements. May be ex-library. Shipping & Handling by region. Buy with confidence, excellent customer service! BCA, 2005. Paperback. Good. Condition very good. John Wiley & Sons, USA, 1963. 2nd Edition. Soft cover. Very Good. 3rd Printing. Size: 8vo - over 7¾ - 9¾" tall. 343 pages. This book is in very good or better condition. It has no tears to the pages and no pages are missing from the book. The spine of the book is in strong condition. The front cover has some very minor bumps and marks indicating previous use but overall is in really nice, tight condition. Items are in stock and will be shipped same day or next business day directly from our Australian address. SYNOPSIS: Recognized as the classic resource in cartography. Quantity Available: 1. Category: Cartography; Pictures of this item not already displayed here available upon request. Inventory No: 0002535. .
New York, NY: John Wiley & Sons Inc, 1969. 3rd Ed 2nd Pr. Orig owners name & address stamped inside front cover. Discarded personal library, book stamp impressed on title page, stain on outer content edge top, content not affected. Hardbound. 4to. 415 Pgs.. Acceptable in DJ/Fair. 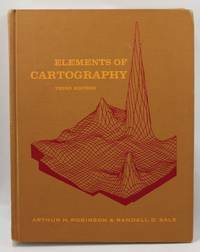 Elements of Cartography by Arthur H Robinson. Published by John Wiley & Sons Inc, New York, NY, 1969. 3rd Edition 2nd Printing. Hardbound, Paper DJ. Size 4to (up to 12'' tall). Condition: Acceptable in DJ. Orig owners name & address stamped inside front cover. Discarded personal library, book stamp impressed on title page, stain on outer content edge top, content not affected. 415 Pgs. ISBN 0471728055. By Arthur H Robinson and Randall D Sale, both of the Department of Geography, University of Wisconsin, Madison. This book treats cartography as a method of communication, covers all the essential elements, and was prepared with both the student and practicing cartographer in mind. It dissects the map-making process to reveal the principles on which it is based. Illustrated with drawings and photographs. Description text copyright 2008 www.BooksForComfort.com. Item ID 17019. 1969. John Wiley & Sons, Inc. New York. 3rd Edition. 415pp. SBN: 471728055 ISBN: 0471728055. Book is in good- condition. NOT EX-LIBRARY. No DJ. Brown boards, with dark yellow lettering & red illustration on cover. Good binding. Body of text is clean. Price stamp on title page, date written on back endpaper. Corners are bumped. Corner edge extends past rest of text on page 179/180. Larger book, may require additional postage. Contents include: 14 Chapters on Cartography + Appendix + Bibliography + Index. SEE PHOTOS for condition of book you will receive. ALL PHOTOS taken by Hideaway Books at time of listing. Condition based on age of book. To ensure you receive the quality of book expected we provide pictures of NOTICEABLE WEAR for ALL books we sell with marked conditions of GOOD + . If you have any questions at all dont hesitate to send us an email. John Wiley & Sons, 1960. 1960 US Edition. hardcover. 343pp, VG. . Glacier Books are experienced and professional booksellers. We take pride in offering carefully described books and excellent customer service. John Wiley and Sons. Used - Good. Former Library book. Shows some signs of wear, and may have some markings on the inside. John Wiley and Sons (WIE), 1969. This is an ex-library book and may have the usual library/used-book markings inside.This book has soft covers. In fair condition, suitable as a study copy. John Wiley & Sons, 1987. This is an ex-library book and may have the usual library/used-book markings inside.This book has soft covers. In good all round condition.